Known as Bakos' compound, this is a compound of 4 cubes. To obtain this compound, imagine starting with 4 coincident cubes, then rotate each one 60 degrees around a different 3-fold symmetry axis (the axes through opposite vertices, top inset picture above). Since this leaves two opposite vertices at the same position in each cube, you can still see all 8 vertices of the original cube in the final compound (bottom inset picture). This model is provided in Great Stella's Polyhedron Library. Its dual is a compound of 4 octahedra. Here's a surprising way to create this model. Start with the truncated octahedron (shown top left). Change to a view of the stellation and hit the Up-arrow twice to get the stellation shown here (top right). Enter Create Facets Mode and create the two facets shown (top right and bottom left). 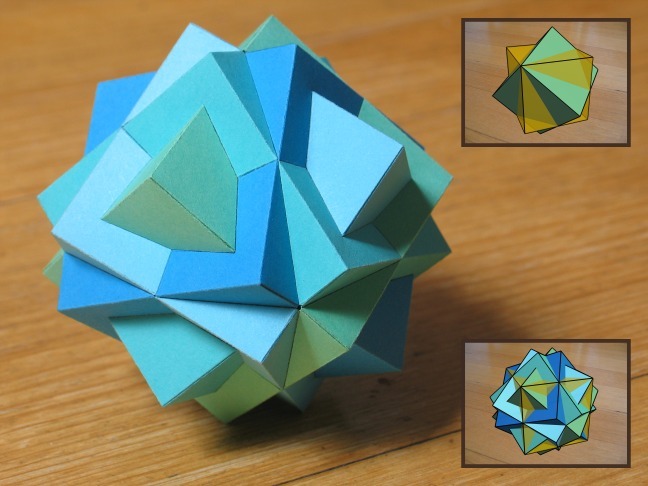 Use "Poly>Create Faceted Polyhedron" to create the compound of 4 octahedra (bottom right). "Color>Color as a Compound" can be used to render each octahedron in its own color. Then the dual of this model is the 4-cube compound. The reason this works is that the dual compound of 4 octahedra requires 4 initially aligned octahedra to be each rotated 60 degrees around axes through opposite faces, so two triangles of each octahedron are rotated within their original planes. This is what's happening when we go to the truncated octahedron. The hexagons can be surrounded by triangles in two ways. One way gives the original faces of a single octahedron. The other way gives us one of the faces of the 4 octahedron compound. Stellation is just a convenient way to access the new vertices required for these rotated triangles, and then faceting allows us to connect the remaining triangles.